A car battery voltage test can be used to determine whether or not your batter has reached the end of its life expectancy. A car battery life expectancy can range from between four and five years before it will no longer hold a charge. However, depending on the climate where you live, it can be even shorter. In areas where the temperatures are much higher, like in southern California, Texas, Arizona and Florida, the lifespan of your battery can be as low as three years. A fully charged car battery voltage for a vehicle that isn’t running should fall between 12.4 volts and 12.6 volts. Each battery is complete with 6 separate cells that each contains 2.1 volts, for a total of 12.6 volts. 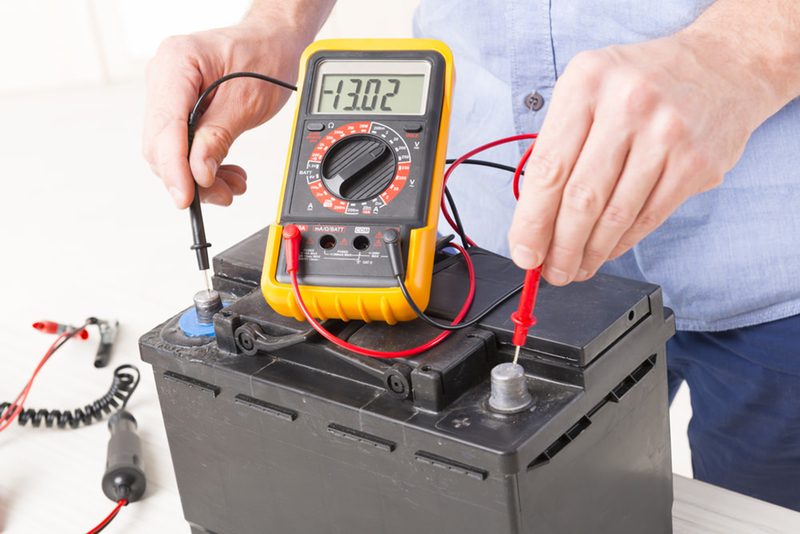 If your car battery voltage is discharged, or has less than 12.4 volts, the power decreases dramatically. For instance, a deficiency of six tenths of a volt can lead to a power loss of up to 75%. There are several reasons your car battery voltage can be too low. One of the most common is age. If your battery is between 4 and 5 years old, its ability to hold a charge will decrease drastically, even if you attempt to recharge it. Some more common low voltage readings can come from leaving lights on after the car is shut off, leaving the glove box open with the lights on or having the doors opened for prolonged lengths of time. Some reasons aren’t directly due to irresponsibility of the vehicle owner, for instance, there may be a short in the battery. The separators between the cells within the battery can fail between positive and negative walls. There is also the possibility that corrosion within the battery can interfere with connections. Additionally, the battery case can become damaged or cracked, along with the terminals. Another common cause of low voltage is due to prolonged time in a state where the battery isn’t being used. When a battery sits for long periods of time (generally a year or more) sulfation occurs which causes the battery to lose its charge internally. There are also cases when car battery voltage can become too high. This is generally the result of overcharging your battery. Batteries are composed of lead-acid. When a battery is overcharged, the electrolysis of water inside the battery will produce hydrogen. Depending on how overcharged the battery is, will determine the damage that can be done to the battery. Car batteries are designed so that if the battery becomes slightly overcharged the hydrogen can escape through tiny vents in each of the six cells; however, if the battery is severely overcharged, it has the potential to explode with the smallest spark. This overcharge is usually caused by the charging system of the car, or an unregulated alternator. If your battery voltage is too high and the battery becomes damaged, or your battery is over 5 years old, you may need to replace the battery by going to your nearest parts store and using the car battery size chart to find the right replacement. However, if your car battery voltage is low, you can use a battery charger to bring the voltage back up to normal levels. Some car battery chargers are electric, but there are also solar car battery chargers that can convert light energy into current to initiate a trickle charge.